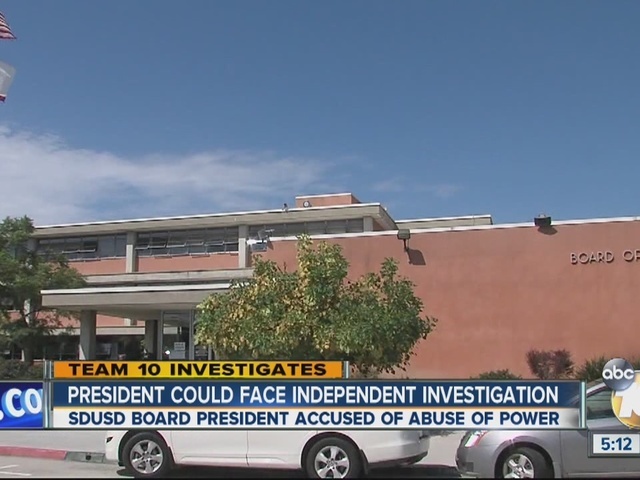 SAN DIEGO -- San Diego Unified School District trustees voted Tuesday to order an independent investigation of board President Marne Foster, who is accused of abuse of power. After a closed session meeting last week, Trustee John Lee Evans said he would ask for an investigation into a fundraiser held by Foster to help pay for her son's college expenses, and whether she was secretly behind a $250,000 claim against the district filed by her son's father that accused the school of sabotaging the youngster's college plans. The claim was rejected by the district. At last week's meeting, the Board of Education also authorized Superintendent Cindy Marten to release information regarding Foster's alleged involvement in a shakeup of leadership at the School for Creative and Performing Arts, which her son attended, according to a statement read by Evans. The information was released Monday and you can read it here . Evans said that while personnel issues are discussed in closed session, the board has to authorize investigations at a meeting open to the public. The meeting is set for 5 p.m. at district headquarters in Normal Heights. Meanwhile, Team 10 has learned that former School of Creative and Performing Arts principal Mitzi Lizaragga (who is now a principal at a school in Los Angeles) and counselor Kim Abagat have retained an attorney. Dan Gilleon represents Lizaragga and Abagat. Gilleon said what happened to his clients was retaliation. “It was really vindictive… they believe it was Marne Foster using her influence to have district administrators punish them,” Gilleon said. Tuesday morning, parent Gloria Tran also asked for the grand jury to open an investigation into Foster. "I don't have a lot of faith in an investigation backed by the school board," Tran said. The grand jury already released a report on the board member's actions earlier this year and found the board needed stronger ethics rules. Tran believes new information has surfaced since then. Foster's supporters also spoke before Tuesday's meeting, asking for due process for the president.